You can tell a lot about your dog by taking a good look at her skin. Clear and clean skin is a good indication your dog is pretty healthy. Color is consistent and it springs back when touched. No scales, crustiness, or roughness, no eruptions or scabs. Free of fleas and ticks. Infected or irritated bites from parasites mark the beginning of many potentially serious skin conditions. Allergies to substances such as food, pollen, cleaners, or even flea saliva. Keep your dog away from caustic products such as carpet cleaners or lawn treatments. A vet can help pinpoint the cause and prescribe medicines to relieve the itching. Infections from cuts or flea bites, or bacterial or fungal infections. These sorts of problems all require professional diagnosis and treatment as soon as possible. Too-frequent baths, regular or prolonged swimming in dirty water or highly chlorinated pools, and exposure to environmental hazards. Flea and tick bites, which can quickly turn into infections and bigger problems. Be sure to practice good flea and tick control. One of the most common skin problems requiring a vet’s help is the “hot spot”–a bacterial infection officially called pyrotraumatic dermatitis, or moist eczema. Hot spots begin as infected bites or scratches, and as the infection spreads–very rapidly–hair falls out, pus forms, and the area begins to smell awful. The spot even feels warm. Hot spots are most common in breeds with thick coats, such as Golden Retrievers, Cocker Spaniels, and German Shepherds, and they occur more often in the warmer months. But they can afflict any dog at any time of the year. 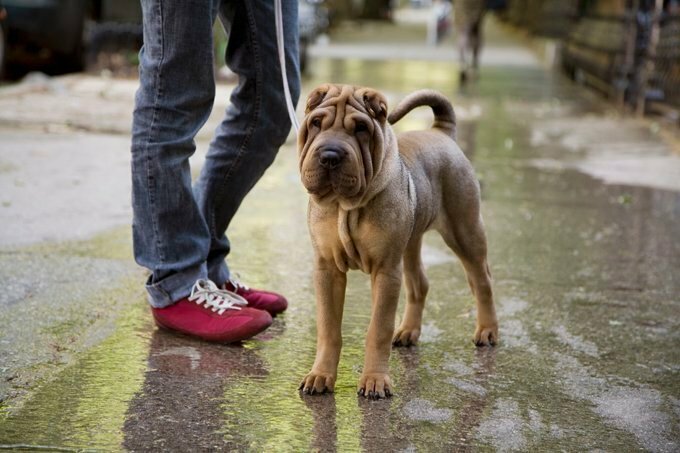 As soon as you see a wet, raw-looking lesion, and especially if it looks noticeably bigger within a matter of hours, make an appointment to see your vet. The doctor will probably shave the area around the lesion, and apply an antibacterial ointment. If it’s really bad, she may give your dog some antibiotics as well. You may need to keep the wound clean and dry and continue applying medicine until it heals. It usually takes no more than a week or two for the sores to dry up, and the hair will grow back in another week or so after that. Can hot spots be prevented? Not entirely, but bear in mind that the sores begin when moisture is trapped by the coat against already irritated skin. Any dog with matted or dirty hair or a naturally thick coat may be more prone to hot spots, so shaving your dog in the summer might help. Regular bathing and brushing can also make it less likely your dog will develop hot spots. Most of these conditions can be handled by using a topical cream, medication, or dietary supplements. Good nutrition can fend off skin trouble. Feeding your dog supplements, such as essential fatty acids (EFAs), may help as well.. Even if supplements do help, it will be a matter of weeks or months before you’ll be able to see significant improvement. Grooming is an effective way to improve your dog’s skin (and coat) health. Brush your dog regularly with a soft-bristled brush; bathe her once a month, or so; and apply flea medication every month.